Just when we were thinking of going out to a nearby shopping mall, a heavy thunderstorm accompanied by lightning surfaced in the sky. Simultaneously was going on the constant storm warnings on TV. So forced by the circumstances, we changed our plan and stayed put at home. Now, I don't know about you guys but I don't like spending my weekends loitering in home. I just need to go out even if it's a grocery shop in the weekend. It was a mighty sad affair for me to sit at home on Sunday evening doing nothing precisely. So out of the freezer, I pulled a package of frozen fish out and thawed them to room temperature. Forthwith, I thought of cooking Dhone Puti to relieve my frustration over the spoilt weekend. Nature has to play the role of a party pooper always to doom my plans. Though among the tiny fish preparations, I always adore Puti Mach Tok Jhal Mishti or Morola Macher Tok over anything else, but for a change, Dhone Puti tastes great too. It is a simple delicacy cooked with a batch of coarsely chopped coriander leaves and lots of cumin powder. 1) Heat oil in a wok. When oil reaches smoking point, toss the fish lightly coated in a pinch of salt and turmeric powder and fry till golden brown. Once fried, take them off the flame. 2) Into the same oil, add the ingredients for sauté and allow them to crackle. 3) Add onion and fry till translucent. Add ginger paste, turmeric powder and cumin powder. Sauté for 2 minutes. 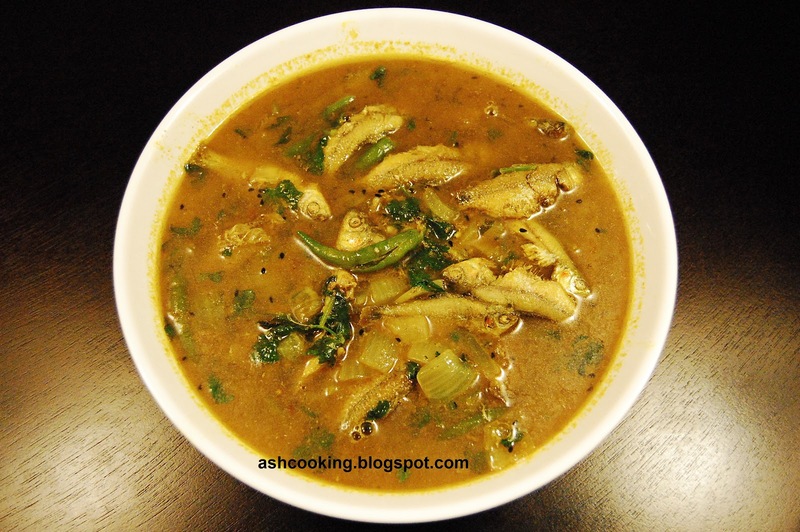 4) Add green chillies and pour 1 or 2 cups of water till you get the right consistency. Add salt and bring the gravy to a boil. 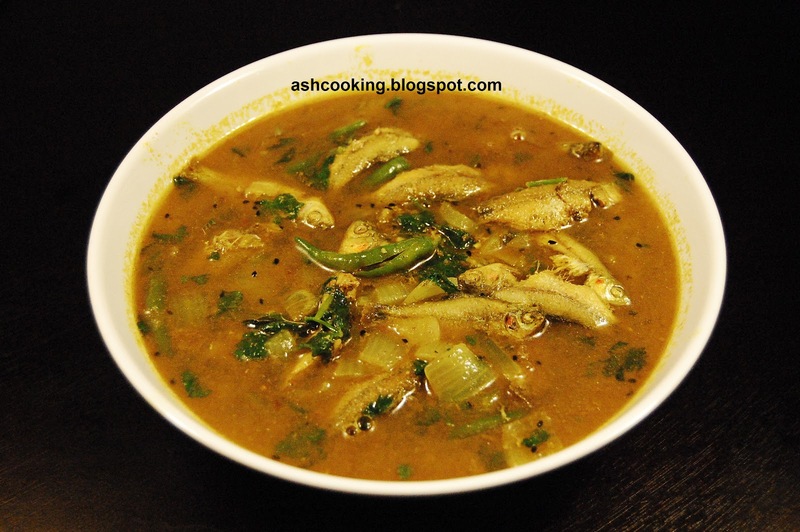 5) Mix coriander leaves and slide in the fried fishes into the gravy. Turn off the heat and keep covered for 2 minutes before serving.